The Defensive Shell is a good idea in theory. Unfortunately, it doesn’t work. The results of score effects are pretty basic hockey analytics knowledge at this point. Teams down in goals tend to take more shots, while teams up tend to take less, with the effect becoming larger as the game goes on. 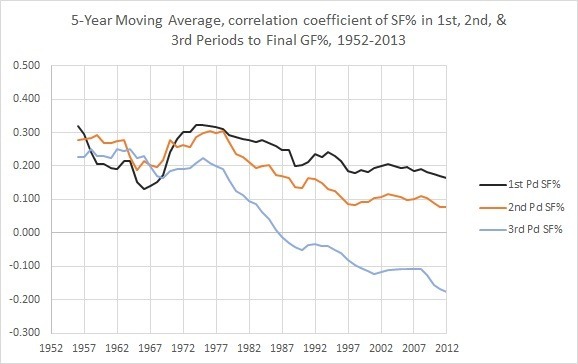 Friday Quick Graphs: When did “Score Effects” Emerge in NHL History? Back in 2009, Tyler Dellow first elaborated on the idea of what we now call “score effects,” or how teams with a lead will go into a “defensive shell” and purposely withdraw from the possession battle to preserve their score. Score effects are the primary reason the go-to possession stat is “Fenwick Close” today – the “close” implies the importance of looking at possession measures when teams still have a reason to engage. 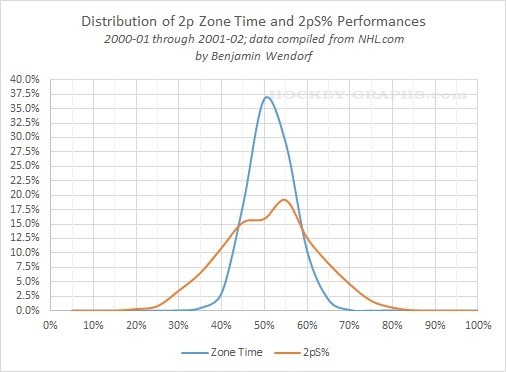 The limits of historical shot recording, and the possibility of score effects, are precisely why I’ve advocated the use of 2pS% (shot-differential percentage from the first two periods) as an historical possession measure. As you can see, score effects have essentially become the norm, much to the detriment of overall shot differential. At any rate, whomever put two-and-two together back in the 1970s probably had the right idea; I’d forward the hypothesis that the 1970s NHL was ripe for change and innovation (a lot of competition; growth of league = increase in decision-makers and opportunities to exploit market inefficiencies). In that kind of environment, protecting the lead quickly became a best practice, and it steadily grew to a league-wide practice by the mid-1990s or so. * Or a -1.0 to +1.0 relationship of the variance in one variable to the variance in another; positive means as one goes up, the other tends to go up, suggesting a positive relationship or correlation. 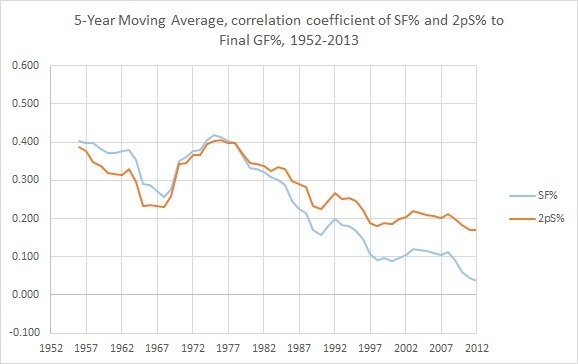 A negative correlation suggests that, as one goes up, the other tends to go down. The closer to 0.0, the less likely the variables have any relationship at all.